On Monday Burger King’s official twitter site was hacked. The hackers played a terrible joke on the company by changing the avatar to the signature golden arches logo and the background to a McFish Bites promotional ad. The hackers also changed the profile description by saying McDonalds now owns the Burger King franchise. Burger King received criticism for the slew of offensive messages that went out under Burger King’s account name. One wouldn’t think things could get much worse for a company that just got busted for using horse meat in their burgers two weeks prior. Surprisingly, this PR fiasco was not all bad for Burger King. Its Twitter followers grew by 5,000 within the first 30 minutes of the account being hacked. Only two days after the Twitter hijack the page received a whopping 30,000 new followers. Not to mention, this scandal conveniently outshines the whole horse meat issue. 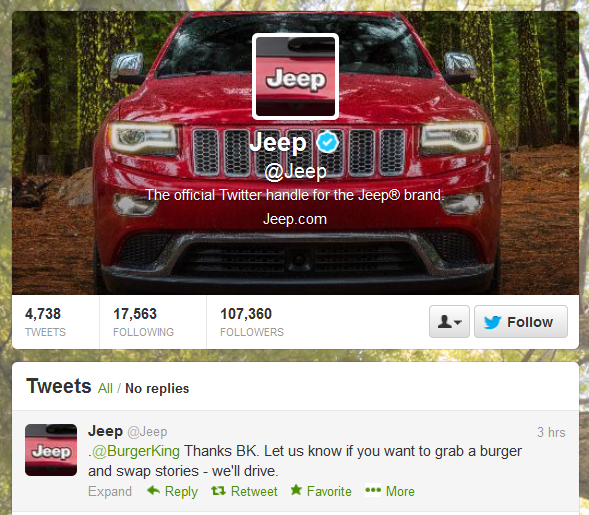 On Tuesday, Jeep’s official twitter account was also hijacked by the same Burger King hackers. The adjustments to their page were similar to the Burger King/ McDonalds edits. Jeep’s Twitter followers also increased by nearly 5,000 from the hacking crisis. It was important for both Burger King and Jeep to quickly recover the accounts and manage the hacking crisis before it got out of hand. If either company were to let this get out of control the impact could have been much more negative from the public… especially with the offensive images and messages being tweeted. Letting the hijacking last too long could have caused backlash towards Burger King and Jeep for being negligent and insensitive to potential consumers. After both companies regained control of their accounts, they seem to be in good spirits. And why shouldn’t they be? What could have been a PR disaster turned into an increase in followers and not too much flak from the media about the offensive tweets. MTV attempted to fake hack its Twitter account in hopes to gain some of the same publicity that Jeep and Burger King received. They have gotten a lot of backlash for the attempt. That is why it is never a good idea to create your own PR stunt. Is Adobe Social the answer to social media measurement?